If Osiris, ancient Egyptian god of the underworld, and Tyrannosaurus rex, king of the dinosaurs, somehow had a baby, and that baby was an asteroid-bound spacecraft, it would be named OSIRIS-REx. 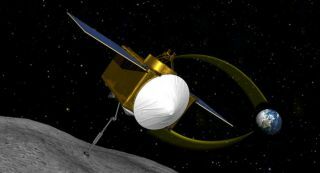 Yes, OSIRIS-REx is the acronym for the vessel that, NASA just announced, will launch in 2016, travel four years to an asteroid, chip off some rock samples and bring them back to Earth. The combination robot-spacecraft is the brainchild of researchers at the University of Arizona Lunar and Planetary Lab. And so is its funky name. The deputy principle investigator of the OSIRIS-REx team, Dante Lauretta, is a mythology buff. "Why he has this interest I have no idea," principle investigator Michael Drake told Life's Little Mysteries, a sister site to SPACE.com, "but he was doodling on a pad and trying to capture the principal themes of what we are trying to do with this mission — study life origins, identify resources, planetary security in the form of asteroid deflection – and he realized he got the name of Osiris out of that, an ancient god of Egypt who may have been one of the first pharaohs." This article was provided by Life's Little Mysteries, a sister site to SPACE.com. Follow Natalie Wolchover on Twitter @nattyover.